78, peacefully passed on January 23, 2019 surrounded by his loved ones. 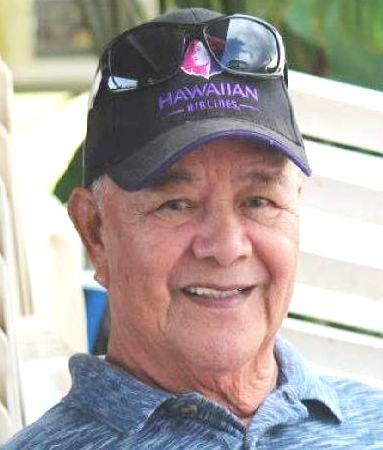 Born on August 6, 1940 in Maunaloa, Moloka'i, he is a Molokai High School Graduate and retired Operator from Maui Electric. He was an avid golfer, baseball player and loved Las Vegas & "Chicken Fighting". His greatest love was for all of his grand- children & great grandchildren. He is survived by his wife, Leola; children: Conrad "Zuzu Boy" Aquino, Candy (Oboy) Pedro, & Lisa Noe (Harold) Esteron, predeceased by son Darrell Gene (Carolyn) Aquino. Grand- children; Ipo (William) Davis, Ehu (Kory) Tabilangan, Nainoa (Kaprice) Pedro, Pono, Kamalani, Ash & Jacob Esteron & Ryan Aquino. Great Grandchildren; Alea, Kala'i, La'iku, London & Kingston Davis, Kolee & Nohi Tabilangan, Syden, Liam & Kyrie Pedro.